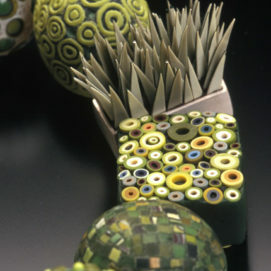 Seattle artist Cynthia Toops has always been fascinated with beads. An ivory cicada bead carved by her father is one of her most cherished possessions. However, it was a copy of Lois Sherr Dublin's "The History of Beads", which catapulted this fascination into a passion and career. Falling in love with the Roman face beads on the cover, Cynthia was inspired to make her own versions. 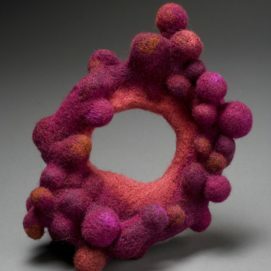 During a visit to her native Hong Kong, Cynthia discovered polymer clay and fell in love with the medium. Cynthia is inspired by 18th Century Italian micro mosaics, as well as the elaborate works of Mexico's Huichol Indians, who embed seed beads in hot wax. Adapting these styles to polymer clay, Cynthia developed techniques that work for her and are 'simple and very low-tech'. 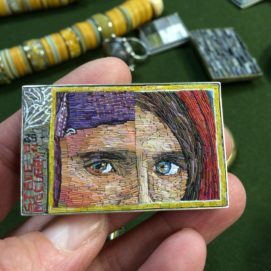 Using this technique of mosaic in her work, Cynthia is able to create tremendous richness, texture and subtle color variation on a single piece. Cynthia is widely published and exhibits and teaches throughout the United States.